Pacproinc® understands the stress that is so common among philly steak applications. With durable, high-speed interleaving equipment and maintenance plans that offer 24/7 factory support, we can help to alleviate that pain. We also offer a range of interleaving materials appropriate for philly steak applications, and the PPI-200 assists with stack shuffle experienced with reverse-fold or full-wrap interleaving. And with over 20 years experience—we are the longest continually operating manufacturer of interleaving and counting/stacking equipment—we offer a rugged design that ensures outstanding reliability and uptime. Pacproinc® are the experts in Interleaving and Stacking. Philly Steak Interleaving is an excellent example of portion control using interleaving to separate a multiple slice portion. Depending on portion size and condition these systems are capable of speeds up to 400 portions per minute. All of our solutions are available as a combination interleaver and stacker or as standalone components designed to fit your application. The PPI-200 product line is a sanitary, washdown-duty, stainless steel system. The streamlined design incorporates leading-edge Programmable Logic Controller (PLC) and servo motor technology, ensuring low maintenance and a long machine life. 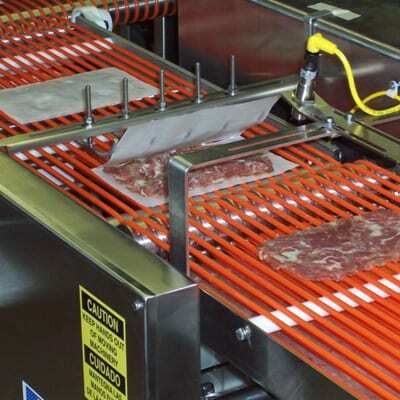 With compact designs available, the PPI-200 requires a minimal amount of floor space and is engineered to exceed the American Meat Industry’s 10 Principles of Sanitary Design. Like all of our designs, our stand-alone counters/stackers feature rugged, stainless steel construction and climate-controlled, fully gasketed enclosures. Our PLC design enables easy production setup and changes to parameters like stack count, delay, speed, and portion thickness, and our solutions are easily networked with changeover or stoppages.